Levent Atici is executive director of UNLV’s Office of Undergraduate Research in the Division of Research and Economic Development, which connects undergraduate students and faculty with the resources necessary for successful research experiences and offering programs for professional development. Atici is also an associate professor of anthropology and archaeology with a technical expertise in zooarchaeology, the study of hard animal tissues such as bones, teeth, antlers, horn cores, and shells excavated from archaeological sites. After receiving his Ph.D. from Harvard University in 2007, Atici joined UNLV’s department of anthropology as an assistant professor in the same year. 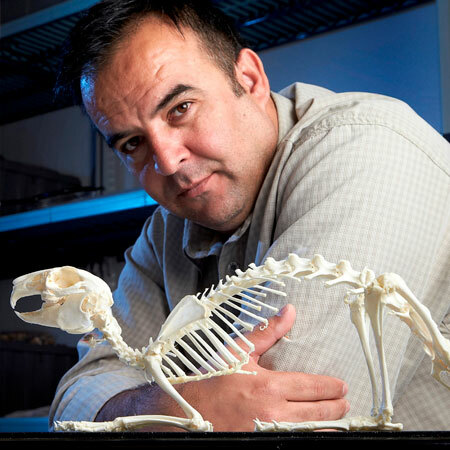 He founded the UNLV Zooarchaeology Laboratory in 2009 and established large collections of modern and archaeological animal bones for research and teaching purposes. Atici’s research probes human-animal interactions, with an emphasis on the two greatest progressive revolutions that humankind has experienced: the Neolithic Revolution, wherein humans transitioned from hunting and gathering to farming, and the Urban Revolution, wherein small-scale agricultural societies developed into sociopolitically and economically complex urban centers. He considers these different strategies as phenomena on a continuum and seeks to bring the correlations between patterns of sociopolitical organization and animal exploitation into a sharper focus. Atici has published extensively on subsistence economies of last hunter-gatherers and first farmers as well as urban food provisioning in ancient Anatolia (present-day Turkey). He has been awarded prestigious competitive external grants from the Wenner-Gren Foundation and National Geographic Society for his work on food provisioning systems in early cities and on the origins and spread of domesticated animals in Southwest Asia. Atici also received the prestigious UNLV Barrick Scholar Award in 2015 and the Outstanding Undergraduate Student Researcher Mentor Award in 2018. Archaeology, prehistoric foraging economies, origins of agriculture, origins of inequalities, urbanization and state formation, evolution of pastoral economies, ancient trade, food and ethnicity, zooarchaeology and taphonomy, Eastern Mediterranean, Southwest Asia, Turkey.